Ok, we get it, most of you are struggling just to get some content on your site and now we have someone talking about “Interactive Content.” The way things are changing it almost makes you want to go into sales. 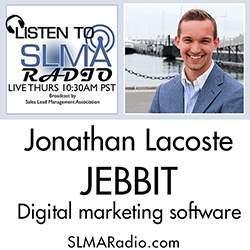 But not too fast, this interactive content thing is the wave of the not too distant future and the SLMA has an expert on the subject with Jonathan Lacoste, president of Jebbit. The host is Jim Obermayer. Jonathan Lacoste is an award-winning entrepreneur and writer. Lacoste is the co-founder and President of Jebbit, a digital marketing software company he founded as an undergraduate student in 2011. Since launching the company, Jonathan has been named to Forbes' "30 Under 30," was the "Emerging Executive of the Year" in the state of Massachusetts and is considered the youngest entrepreneur to raise venture capital, at age 19. Jonathan pens “The CMO Corner” column for Inc Magazine, sharing marketing-tech trends and tips from CMOs in various fields. In his spare time, Jonathan is an avid marathoner, having run 13 to date. Jebbit is a venture-backed company offering a digital marketing platform that creates engaging micro-content, personalizing a brand’s interaction with each individual in its audience. Over time, our solution transforms the unique data we’ve captured into rich consumer profiles, which integrate with any marketing technology stack.